Here’s the first part of a short story about a young woman who is anxious about her age as many people are. The story reveals the reasons for her anxiety and how she’s handling it. She’s offered another perspective though. Let’s find out how she responds. Although written in the first person, the story is entirely fictional. 08:02 a.m. My elder sis is growing older and wiser. Love you loads. ?? 09: 52 a.m. Tomorrow, we shall have a blast. You’re only 30 once. ??? By then, I’d had it and unfriended him without delay. What right had he to announce my age repeatedly on social media? Like he had nothing better to do. Like he was commissioned to ruin my day and trigger this melacholic attack I am suffering right now. I’ve warned Fred repeatedly about his morbid habit of announcing that I’m his older sister at every opportunity. Why does a man who is married with kids feel the need to introduce a single girl that way? And why this attempt to rub in the fact that my years are piling up? He was obviously opening me up to ridicule. For example, one of his friends commented on the last post above, “She needs to, cos after dat, evrythn goz downhill.” I imagine there will be some other snarky remarks following each of those posts. I’d best be deleting the lot as soon as I can. And I’m placing a moratorium on every social media interaction. It’s just too depressing for now. People are graduating from school, getting married, having kids, travelling, and what can I report? My business is stagnant, I have no money to further my studies, no bae (hate the sound of “boo”), no fancy ride, no posh crib, nothing to display. 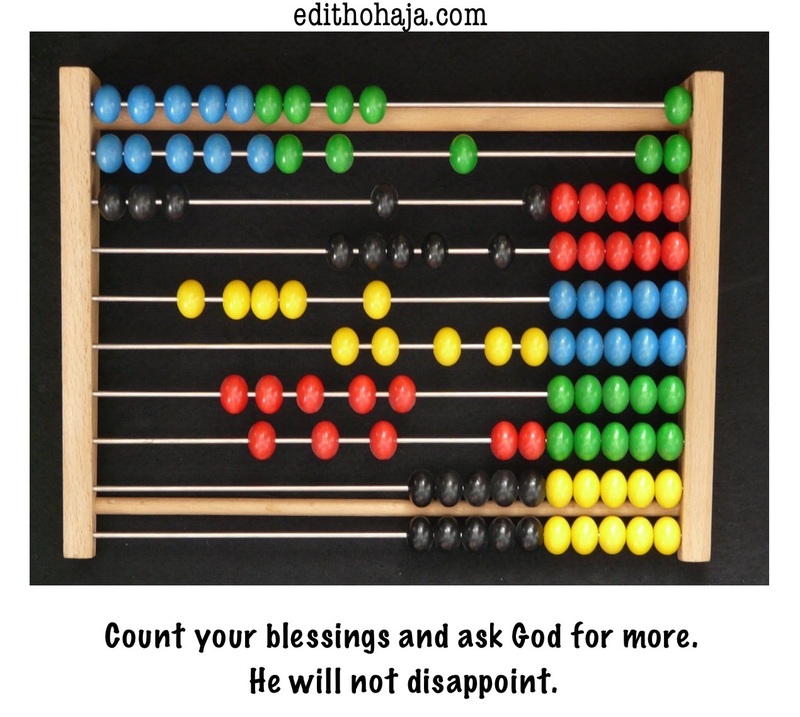 “Count your blessings …,” the popular song rings in my mind. “Pleeease!” I counter. I’m just too upset to attend to any client today, so I shut my office and go home for a pity party. As I undress, I look with disgust at the cellulite on my thighs. I lift my arms and hiss at my close-to-flabby upper arms. I stand before the mirror, turn around and shake my head. I really must hurry and snag myself a man before I develop chicken wings and a massive behind. “Count your blessings, name them one by one, and it will surprise you what the Lord has done,” plays in my heart. *”Abegi” is pidgin English for “please” with a sneer attached. Anxiety can bring desperation and insolence. This is pretty much like how Job in the Bible sounded at some point in his ordeal. Have you ever felt so pressured about something that you reacted like this? The next instalment shows how the girl resolves her inner crisis. Be sure to read it as it offers insight for those who are feeling weighed down by their current place in life. nice post...true true, we should count our blessings one by one. I sincerely love this story,can't wait to read the next segment. PS...I too hate the sound of *boo*. 30 years! That's enough reason to worry. But then God has blessed us with more than enough reasons to smile. Let's count our blessings carefully, we will discover reasons to smile. to be plus one is worth of celebration whether things are as planed or not.nobody should wane u down and cease your happiness of that day. God is the giver of all things and HE supplies to our needs in his riches and glories. so dear happy birth day? I subscribe to the idea that her younger brother, a man married with kids, was wrong to be announcing her age in social media. He could be doing the right thing, but in a wrong way. He knows his elder sister is not married,so his attitude amounts to insult. Some traditions in Nigeria and its social attachment is really annoying. what a lovely story. Her brother should have known that his elder sister is not happy she is growing old without getting married. That is how most people feel when they are aging. Her younger brother is not even helping matters..
AGE IS NEVER A BARRIER..........ITS RATHER A BLESSING...NICE ONE MA PLS UPLOAD THE CONCLUDING PART. Wow what a great piece. one's birthday is suppose to be a joyous day/moment, but seems to be the opposite for Fred's elder sister. indeed, anxiety weighs one down. "count your blessing and it will surprise you what the Lord has done"
na wa ooh. "ndi madu sef". your brother is celebrating your birthday with you and your annoyed. its nobody's fault you are not married. live your life! nice one ...though marriage is nt everything. our desire becomes our thought always but we should not let it control our positive attitude. nobody wants to be lonely everyone wants to belong to the value and reigning things in the society. hope it ends well with her..
Really, if we count our blessing one by one, we will discover reasons to smile. lol. Fred should be a comedian. repeatedly anoucing she is thirty, what are his intentions? Lol..what an annoying and caring brother... And what's wrong with being single at thirty? She go marry herself abi na wetin? Lol! na wa for that her brother oo. Anyway younger bros can be so annoying at times but very loving most times. I shaa feel for her. We should understand that Age is not a barrier to achieving great heights. The moment you start seeing yourself that you are growing old,it starts reflecting on your body.it has to do with our mindset...today you see people who are above forty looking twenty five and you wouldn't know...for emphasis, age is not a barrier for marriage. The right person will come irrespective of your age. age should not be a yardstick of measuring our success. there are many things bigger and better than that. Fred sef, very hilarious. For Fred he thinks he is being caring by the messages to his sister not knowing she doesnt like it. Age is just a number, God's plans for us might come like Abraham's when we are way older. Very inspiring post ma. Gods time is always the best. When God will bless you, all those who said who are you shall come back and say how are you. The African society sees marriage as the ultimate achievement of every successful woman. They often pressurize them to get married once they cloak 30 at the detriment of their personal growth and development. This issue should be properly addressed.... Her younger brother is an inconsiderate fellow who suppose to protect his sister from society's cruel philosophy. Age is but a number, we all have our time in life. Wow! anxiety isnt the right to get things done rather it will make you take wrongs steps and decision so its important you wait on the lord because all that glitters are not gold. and for Fred i think he wasnt fair knowing the situation of her elder sister. LORD, IT'S ALL ABOUT YOU!